Australian researchers are developing a process that could lead to self-cleaning wool sweaters and silk ties. Researchers at Monash University, in Victoria, Australia, have found a way to coat fibers with titanium dioxide nanocrystals, which break down food and dirt in sunlight. The researchers, led by organic chemist and nanomaterials researcher Walid Daoud, have made natural fibers such as wool, silk, and hemp that will automatically remove food, grime, and even red-wine stains when exposed to sunlight. Wine be gone: Wool fibers have to be chemically modified to receive a stable coating of titanium dioxide nanocrystals, which break down organic matter in sunlight. 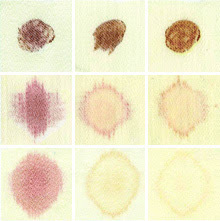 Red-wine stains do not leave uncoated fibers even after 20 hours (top right); unmodified nanocrystal-coated fibers show some stains (middle right). The stain is almost gone in chemically modified fibers because of the firmly attached nanocrystals (bottom right).